ALL.BIZ Canada Canada services IT services Drinks IT consulting IT consulting IT infrastructure consulting service. Unplanned downtime is not an option. For this reason you must implement power and cooling strategies that facilitate the level of system availability you need. Our whole purpose at Potencia Technologies is to help you meet your availability requirements. At the IT or facility level your power and cooling infrastructure is a combination of hardware, monitoring, and management related devices and systems. Careful investigation is critical to insuring that the right solutions are set in place. Careful oversight is required to insure that you do not lose track of the critical resources that you have just purchased and installed to keep your key business applications running. Failure to do the proper investigation up front, or to monitor and manage the systems you have just installed will ultimately lead to inefficiency, a poor level of reliability, and a very low return on the infrastructure investment you've just made. Perhaps you need a small single phase UPS for a rack of servers. Maybe you are experiencing a hot spot within your datacenter and need a spot cooling solution. As server technologies have evolved you are considering implementing a blade server architecture and need to revisit your cooling and power infrastructure to accomodate the higher power densities that are going to be in your new racks. We're here to help you with all this, and much more. 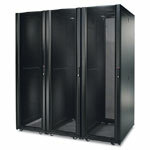 In the complex data center environment it is all to easy to lose track of existing facility resources. This leads to a significant loss of ability to manage your space and plan for the future. Perhaps you require an IT infrastructure consulting service. Potencia Technologies is involved in data center and facility environments on a daily basis, and as such we are able to keep up on the latest "Best Practices" trends and technologies you need to utilize to insure the continuity of your operations. Please review the partial list of services and benefits we are able to bring to our customers to see how we can benefit your company or organization. If you don't specifically see what you are looking for please contact us at your earliest convenience to discuss your needs.